This topic contains 6 replies, has 2 voices, and was last updated by Vadim Smirnov 4 months, 2 weeks ago. 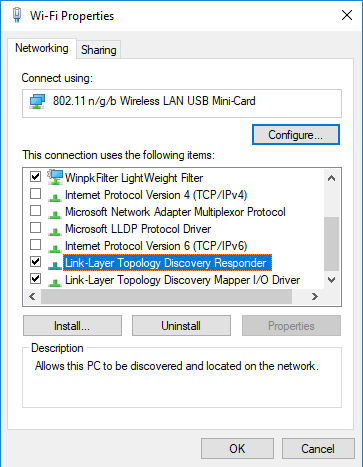 – Wifi interface on a host that is connected to an access point and only has WinpkFilter assigned. So it does not have an IP address. – TAP interface bridged to that Wifi interface. In this scenario the VM fails to acquire a DHCP configuration. Only if IPv4 is enabled on the Wifi interface the VM will receive a DHCP configuration, but I don’t want the Wifi connection to be available via IP on the host. Hmm, interesting case. I don’t have a quick answer because I have never tried this kind of setup. If I have some spare time over the weekend I will give it a try. I did some sniffing on the Wifi interface without IP address. Turns out that the interface doesn’t receive any packages at all, not even ARP replies, if there is no IP configuration active. If I assign some static fake IP without a gateway that is not on the Wifi DHCP subnet, the bridge is working fine and the VM can acquire a DHCP address through the TAP interface and access the internet as well. So functionality-wise this is pretty much what I want, but even though irrelevant on the local host, the fake IP on the Wifi interface could cause collisions if multiple hosts on the same subnet are using this technique. I understand that Wifi cards resp. drivers do not support promiscuous mode, but I would still expect the interface to receive ARP replies even if there is no IP config. Is there any way to trigger this? Problem solved. Sending an ARP probe packet on the Wifi interface at the start of the bridging seems to trigger the packet flow just fine. We will continue to evaluate your driver. Unfortunately it is not as simple as that. Turns out I still had a fake IP on the Wifi interface when testing the ARP probe. I just just thought the IP config was off. So any hints would still be very appreciated!